Copyright �2012 PopEntertainment.com. All rights reserved. Posted: May 31, 2012. Summer is upon us and so it's the smell of grilling wafting in the air. 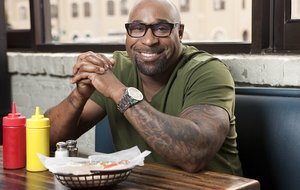 To assist us in our quest for finessing fine grilling exercises, the Cooking Channel has called on one of its vets, G. Garvin � who has enjoyed popular success as chef, author, entrepreneur, and television host � to entreat with some of the best cooking to be found nationally. 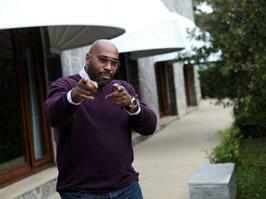 Starting May 29th, the Atlanta native debuts his new show, Road Trip with G. Garvin. Though he built his culinary repertoire during childhood, his earliest experience came with cutting and peeling vegetables alongside his mother in the kitchen of Atlanta�s Jewish Home for the Aging. So besides the obvious local inspirations he has a taste of another kind of orthodoxy to influence him. Raised by a single mom, surrounded by four sisters, the 13-year-old Garvin traded after-school football practice for a job at Atlanta's Old Vinings Inn, soaping dishes and soaking up the inner workings of a high-end kitchen. Two years later, he became the youngest cook at the downtown Ritz-Carlton, where he held seasonal positions. Garvin moved west, initially in 1988, to open the Ritz-Carlton�s Rancho Mirage resort in Palm Springs. At 20, he moved to Europe to further his culinary training and served as Jean Pierre Maharebacha�s apprentice. Then he got kitchen positions in Hamburg and Warsaw, while documenting everything he learned. After nearly two years, he returned to Atlanta to become sous chef of the award-winning Italian restaurant, Veni, Vidi, Vici. However, the lure of the West Coast drew him back, this time, to Los Angeles. During the �90s, he served as Morton�s executive chef, where he orchestrated dinner for the second Annual Vanity Fair Oscar fete, as well as a lavish banquet for the late Israeli Prime Minister Yitzhak Rabin. With doing �really good food� as the goal, Garvin ended up at the former Hollywood watering hole Kass Bah, where he shaped a creative menu appealing to both gourmands and show-biz execs alike. A year later, he became executive chef at the restaurant Reign, which became a smash and earned Garvin great reviews and his highest salary. Yearning for both business and creative success with food, he left there to independently cater high-profile events, including two exclusive dinners for President Clinton, a private brunch for Senator Hillary Clinton and meals for other notable clients. After two years, he teamed with a catering client to open a restaurant. In fall of 2001, G. Garvin�s opened to critical acclaim, then expanding two years later to more than double its size. 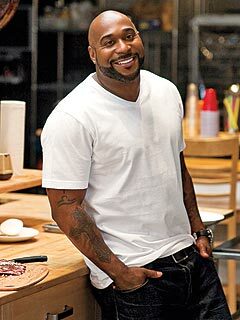 Plans for a series of cooking DVDs brought him to the attention of TV One in early 2004, where his enthusiasm seemed perfect for a new network looking to provide lifestyle programming for the growing foodie audience. It was then that Turn Up the Heat with G. Garvin, came to fruition and now his latest show this summer. Cooking is something you�ve always done. Did you start out doing Jewish food since your mom worked at The Jewish Home? My mother did. I was in the kitchen, doing what I could, considering most of it was culture. Just hanging out with my mom and watching what she did. Then she�d go home and make her own version of meatballs. A little bit, but not too much. Why is there such a fascination with food now? People are learning to understand food in a way that it�s not just something you do. You don�t just eat to live. The science of food, the development of recipes, the new science. It�s become not just something to do, it�s become a lifestyle. People are savvy, where people don�t have desires to be chefs; they have desires to learn how to cook, and make great meals, and understand why you�d do a pinot noir with chicken and steak and pinot grigio with seafood and pasta. There�s a lot of intelligent information about food where before there may not have been. When you grill, do you grill everything? What can�t you grill? Guess you can�t grill watermelon. Nowadays you probably could. Grilling is a method, just like saut�ing or baking, or broiling. You can braise your leg of lamb or grill your leg of lamb. For my show and the show we�re doing, not everything is grilled. But this time of year, there are certain focuses for people. If you want to grill it, figure out a way to do so. I love throwing fish on the grill. I work out five days a week, so I throw it on the grill, it�s all smoky from the wood, and have it with a salad. If you have a desire to grill, you certainly can, but you just have to create a method. I guess it depends on what sauces you use. The bigger issue, and what people tend to forget, is when people grill, they tend to create a big flame and turn it and turn it and get the grill marks. The key components when I grill are hot, medium, and warm. Start with whatever your cooking with a hot flame. If you�re using a sauce, put it on at medium so it coats well because of the warmth. The problem people have is grilling and burning. If you start it super-hot, you get grill marks and flavor, slide it to the medium side to actually let it cook, then finish it on the warm side, it allows you to sauce it while grilling and getting that flavor without burning. Are there meats or foods you haven�t used that you want to explore like, say, ostrich? I have never used ostrich. Alligator I love. I have cooked rattlesnake and bison in the past. So I would think that the next thing for me, I�ve been thinking about a good dish with some alligator. Have you tried grilling insects? Supposedly people do a lot with grasshoppers. I�ve heard that and seen different people do that all over the world. It�s going to be less about me, and more the demographic that I�m cooking for. It would be a hard sell. I think people are more open minded about where things are going with food, but I think it�s key to talk slowly. You could throw it in as a side dish. We got people comfortable with escargot. There are certain cheeses that they have with worms that people are eating in France. I think it�d be a hard sell in America. But people are open to getting themselves prepared for something. You certainly have to ease your way in. Frogs legs are great, I love them. I never tried them grilled. The grill is a great component. It gets you out of the kitchen and into the backyard or park. Grilling can really be fun. How large do you like your grilling environment to be? I�m a big guy, so I like a big-boy pit. I like to throw a whole tenderloin, whether it�s pork or beef, side of ribs, whole side of salmon. We actually did that in Houston. Grilled a whole side of salmon, with brisket and some shrimp. I like big, smoky, loud, big-boy grills. How about tuna � do you put the whole thing on the grill? You can, but tuna is one of those delicacies. When I think tuna, I think cerviche, carpcio, tartare. Navy black, I used to do a blackened pepper and mint with shiitake tuna, but I don�t know if I�d ever throw the tuna onto the grill. Do you ever worry about carcinogens that supposedly occur in some foods during grilling? I�m just not qualified to answer that question, unfortunately, so I couldn�t answer that question intelligently. Grilling has been around as long as I can remember. It has changed, absolutely. It�s not harmful but I�m not a doctor. If there is a concern, people should grill in moderation, but I cannot speak intelligently on that philosophy. Guess it depends on what you grill with. There is some concern. Oak wood, open flame, it can�t be too harmful. It�s the way of the caveman. Throw it on the grill with a natural flame and oak wood. So your preference is oak wood? You have your On the Road series and then you have your grilling. Are those separate environments or do they interweave? They sort of work together. The name of the show is Road Trip with G. Garvin and there are some episodes where we do grill, but primarily, it�s about road trips, finding unique restaurants, finding great things about those places and working with those people and those places. Where do you like to travel when on the road � where do you like to go? What we love is that we love to see something in a community that all the locals are talking about. A mom and pop spot that�s not visible to the regular traveler. Whether it�s a burger, or a sandwich, or pasta, or pie, we can�t adhere to the culinary streets, if you will. We�ve gone to Austin, Houston, Nashville, Atlanta and New York. I�m looking forward to going to Virginia, Chicago and Philadelphia. I�m really looking forward to Vietnam, Peru and Brazil. I�m hoping we can go to a lot of great places where we can find some great dishes. How small do you get or big do you get? We get Nashville small and we get Austin big, so it�s a little of both. We get Lafayette small. But there�s big flavors and big things going on in places like Austin. We hit Charleston, which was a great place, but small. We got both. When did you decide to move back to Atlanta after living in Los Angeles? It�s because I grew up in Atlanta. I started my food career there. When we decided to do this show, the network wanted to do the first episode in Georgia, so that was one reason. I�m opening a restaurant in the Atlanta airport, that�s reason number two. I opened a studio in Atlanta where we shoot videos and host parties. It just made good food business sense to go to Atlanta, so I did. You already have the media profile, so you�re not losing something by not being there. That�s a great point. Outside of the weather, thank God that I�m busy enough that I don�t need to live in Los Angeles to work. I�ve earned the right to live outside of Los Angeles. I love LA. Most of my adult life has been there. It�s a great food town, but I also love where Atlanta is going as a new food mecca. There�s all sorts of genres of food. The scene is growing and I love being there. You didn�t want to live in NY? It just never came up. I almost did, but right from Atlanta I got a job in California. I�ve always been responsible, never really packed my bags and took a chance. I went to California, loved working there, and that�s where I ended up. New York has always been on the radar, but I�ve been lucky enough that I�ve gone to places where people have interests in southern food. Will the fascination with haute cuisine encourage us to diet better or will we gorge ourselves? People are smart enough now to� one thing I argue is that people are more food intelligent than they�re given credit for. Listen, people like to splurge some times, but everyone has their own personal health requirements. People are smart enough to know what works with them. That�s the one thing I�ve always argued when I have a show or a restaurant, I say people are more food intelligent than we give them credit for. I don�t think anyone is going to over-do it. A small few will, as always, but the overall feels is that are going to indulge less and learn to be responsible. #1 � 2012. Courtesy of The Cooking Channel. All rights reserved. #2 � 2012. Courtesy of The Cooking Channel. All rights reserved. #3 � 2012. Courtesy of The Cooking Channel. All rights reserved. #4 � 2012. Courtesy of The Cooking Channel. All rights reserved.